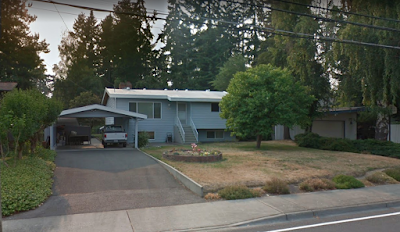 A consultant for the developer of the townhomes proposed for 18521 1st Ave NE conducted the public meeting on Monday, January 29, 2018, attended by 20 people. Townhomes are rowhouses, usually sharing sidewalls. They are built as a unit and then subdivided before sale, so that each owner owns a portion of the site. Owners will need to work together to maintain the property, repair and replace the roof, siding, and other common property when needed. For this project, the townhomes are built close to the southern boundary of the property, with room to navigate vehicles, and some extra parking spaces on the north side of the building. The seven townhomes are built with three stories. The first story is a garage, with room for two cars, end to end. The second level is a Great Room, Dining Room, Kitchen and Powder Room (1/2 bath). The third level is a Master Bedroom and Bath, Bedroom with Bath, and Laundry closet. The most westerly unit is a little wider than the others and has three Bedrooms. The tree in front will be removed. Wiring on site will be underground. Surface water from the site will flow through an underground vault with water filtration, leading to the public sewer lines. There is a 5-ft setback on the north, west, and south sides. The east side on 1st NE is a 15-ft setback. As the building will be east-west on the site, the street view will be the end of one unit. The project will go to permitting in a couple of weeks, but there is no firm schedule for when construction will begin. The single family house on the property has tenants and it will be 5-6 months until they are out. This is strictly a local project. The Carefree Homes owner, Rick Crosby of Richmond Beach, will use his own construction company for the work. The consultant, Lee Michaelis of Puget Sound Planning in Mountlake Terrace, is a resident of Richmond Highlands. Will these be selling for an "affordable" price of a 3/4 million each like the ones up the road on 185th? This upzone is a joke, especially if Sound Transit can no longer afford the 185th station. Better hurry and build before it's to late. And will there be some kind of traffic mitigation for the at least two cars per unit flowing out into the street, intersections, on-ramps, freeway? Oh no, more people moving to Shoreline! Better stick our heads in the sand! If you'd like to see what these look like, there are several on 12th by the Polaris complex in North City - and be sure to admire the continuous lines of vehicles parked along both sides of the block. Just looked at Google maps. Don't see the cars you're referring to. Nice looking units though.